When you visit Madison, you&apos;ll quickly learn that the people you meet and the places you discover are rooted in traditions that transform any day into an experience. From capitol to campus and around every corner in Dane County, you&apos;ll love exploring the history and heritage that make Madison memorable. Take a free, guided tour of the Wisconsin State Capitol and view the exquisite marble, mosaics and murals featured inside this breathtaking building that was designated a National Historic Landmark in 2001. If visiting the Governor&apos;s digs by day isn&apos;t enough, plan to make a stop at the Governor&apos;s Mansion. This Southern Classical Revival home, which has housed Wisconsin Governors since 1949, is open seasonally. Please call ahead for tour dates and times. Another Greater Madison claim to fame is renowned architect Frank Lloyd Wright, who spent his childhood years in nearby Spring Green and returned to build a home and studio called Taliesin when he was at the height of his international acclaim. As a result, there are numerous opportunities to observe his works, from the Unitarian Meeting House on Madison&apos;s west side to the Monona Terrace® Community & Convention Center, built on the shores of Lake Monona in 1997—nearly 60 years after Wright first proposed his idea for a lakeside civic center. And you can&apos;t miss Camp Randall on your next visit to Madison. Today it plays home to the Wisconsin Badgers football team, but it was originally a staging place and POW camp during the Civil War. Almost 70,000 troops were trained there—nearly all of the state&apos;s military might at that time. Find out about the fascinating history of State Street and Madison&apos;s historic neighborhoods via walking and biking tours offered by the Madison Trust for Historic Preservation. Or, do a self-guided tour with these printable guides. Along the way, you&apos;ll spot several museums that focus on local history: the Wisconsin State Historical Museum, which features displays and exhibits about our state and its citizens, the Norwegian Heritage Center, a great genealogy center, and the Wisconsin Veterans Museum, which commemorates the role of Wisconsin citizens in American military history. For more information on museums, check out our Exploring Madison Museums page. In Madison, you can even explore Native American effigy mounds built more than 1,000 years ago! These earthen formations take the shape of recognizable animals such as birds, bears and deer, and can be found along the lakeshore path on campus as well as throughout Madison and Dane County. When you&apos;re here, you won&apos;t want to miss the many experiences that celebrate Wisconsin&apos;s roots in farming and agriculture. View milk, cheese and ice cream making right on the UW-Madison campus when you visit the Babcock Hall Dairy Store! Downtown, you&apos;ll find Fromagination, a retail store filled with award-winning, local artisan cheeses and their perfect pairings. Bavaria Sausage is another retailer that offers a variety of local and imported cheeses, along with specialty meats and sausages. In DeForest, you&apos;ll find Ehlenbach&apos;s Cheese Chalet, a family-owned and operated dairy store featuring more than 100 different kinds of Wisconsin cheeses. Learn more about our distinction in dairy and the fun food culture it creates in our Dairy Discovery itinerary. All year, you&apos;ll enjoy a cool underground adventure at Cave of the Mounds, discovered 78 years ago in Blue Mounds. Nature lovers will want to visit both the Aldo Leopold Nature Center, which pays homage to Wisconsin environmentalist Aldo Leopold, and the UW-Madison Arboretum, birthplace of ecological restoration and an amazing outdoor experience. A big part of Wisconsin&apos;s heritage includes farm-to-table traditions that influence our local dining, brewing, and wine-making businesses. Begin by discovering Dane County Farmers&apos; Market for yourself, or have someone prepare farm-to-table fare for you at restaurants including Quivey&apos;s Grove where you can dine in a beautifully restored 1855 estate that is listed in the National Register of Historic Places. Don&apos;t forget to try a microbrew (or two!) at one of the area&apos;s local breweries, from tours and tastings at Ale Asylum, to pints at Wisconsin Brewing Company, Capital Brewery, and New Glarus Brewing Company. And with six locations around Dane County, it&apos;s easy to find Great Dane Brewing Company, but you won&apos;t want to miss the downtown location, which pairs historic ambiance and an outdoor beer garden with an amazing selection of beers brewed on site. If wine is more what you had in mind, take the short drive to Drumlin Ridge Winery in Waunakee or Wollersheim Winery in nearby Prairie Du Sac. All offer tours and tastings. Want to dive deeper into what makes Madison unique? Now you can. 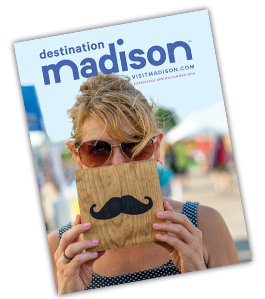 Essential Madison Experiences are your tickets to a behind-the-scenes adventure through one of America’s happiest cities. See some sassy cows on a family dairy farm or experience the University of Wisconsin from the water, the snow, or an art studio. Take an aquatic adventure or embark on a tropical excursion. For a more edible experience, enlist in Bitters Boot Camp, or go on a spirited tour of Wisconsin’s largest craft distillery. Cultivate your creative side to construct a Wisconsin cheese board, or enjoy a tantalizing tasting to open your eyes to a brand-new world of mustard. Experience Madison for yourself.